New mini split Air Conditioning system just installed to make your Kuhio Shores 217 cooling experience perfect. Open windows, trade winds, fans to hear the soothing sounds of the ocean. And now if none of the above works you have use of a quiet, efficient air conditioning system to make your stay as comfortable as possible. Kauai, the Garden Isle, is the most tropical of all of the Hawaiian Islands. Stay in a fabulous one bedroom unit in a luxury condominium at Poipu Beach. On the sunny South Shore of Kauai guests will enjoy lush vegetation and flowers and the least amount of rainfall on any part of the Garden Isle. Mike Galvin oceanfront condo is only 50 feet from the ocean's edge, which allows for easy and quick access to the ocean. There are white sand beaches on both sides of the condo and Sunset Magazine states that this location is 'the best snorkeling site on the south shore.' For those looking to surf or boogie board, this experience is an unforgettable one. The unit includes a lovely and spacious lanai that is great for sunbathing and viewing the spectacular sunsets. The large living room has new wall to wall carpeting, charming rattan furniture, and a queen-size sofa sleeper. This unit will accommodate four persons comfortably and is equipped with 27' cable TV. Wireless DSL high speed internet connection available. The bedroom has a king-size bed, a large closet, and a ceiling fan. The fully appointed kitchen includes a full sized refrigerator, range, dishwasher and disposal, a microwave, blender, coffee maker, toaster, and all of the utensils that would be found at home. Floor to ceiling windows create a awesome views in both the dining room and the living room. Watch the sunset from the living room as the surf pounds the beach at the doorstep, and watch the surfers enjoy one of the most beautiful locations on the Islands. Come to peace, tranquillity and beauty! Included for one car per condo. We felt the facility was classy and the location was great. We were right close to the breaking waves and were able to watch surfers each morning from the Lanai. We intend to go again. Our experience staying at Kuhio Shores and in particular renting from Mike and Sue Galvin has always been wonderful! This was our third time altogether, first time in 217. The other two times we stayed in their condo on the 4th floor. Either one is fantastic and I know for sure that 217 is directly off of the stairs, very convenient. The condo is nicely decorated, furnished and up to date with everything you may need. 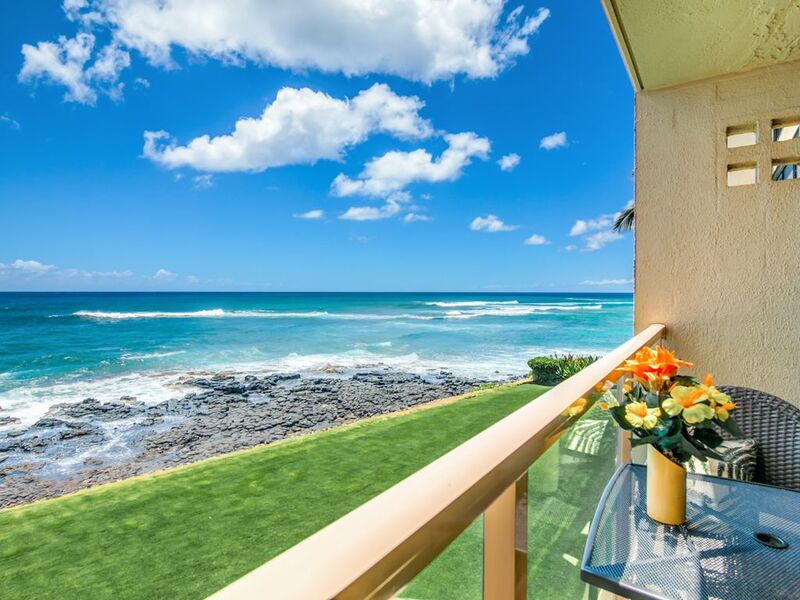 You can sit on the lanai and watch the surfers from sun up to sun down which is better than tv in our opinion. Being next to the beach on Lawai road where the snorkeling is fantastic just kind of tops it all off for us. We found ourselves hanging out there more this time, who needs to drive! The grassy area in front of the restaurant is nice when the tide comes up and the beach disappears for part of the day. We highly recommend this property and can't wait to go back again. Mike and Sue are wonderful to work with. They are organized, timely and you can count on them. They want you to have a great time in paradise! The condo was very clean and comfortable. The updated kitchen had everything you need to save a little and enjoy meals in with gorgeous views from the lanai. There is a cove within walking distance that offered amazing snorkeling. We had sea turtles greeting us every time we stepped out onto the lanai. It is close to shopping and restaurants. We would definitely stay here again. We returned two days from beautiful Kauai and our visit to Kuhio Shores . This was a birthday trip for me, received 11 months prior, and the visit of a lifetime. Our condo was a wonderful surprise, with a gorgeous view and many amenities, which made our trip not only fun, but convenient. Not only did we avail ourselves of the lanai for a glass of wine or morning coffee, we enjoyed breakfast each morning in the dining nook, which allowed us a leisurely start to our day. We enjoyed proximity to shops, beaches, tourist attractions, and the Beach House restaurant, which was right next door. We also loved the outdoor ambience of Brennecke's, Keioko's Paradise, and the Olympic Café. We loved the sound of the surf and the golden sand beaches, and the overall kindness and courtesy of everyone we met. We participated in CJM trailrides, Kauai Sea tours (dinner tour to Napali ), the wonderful luau at the Grand Hyatt, and the Koloa Zipline. It was the trip of a lifetime, and we are already thinking about when we can return! Just spent 8 days at #217 and found it to be an amazing place to stay. Located right on the oceanfront and the waves are crashing on the rocks for a very restorative and relaxing sound. The view from all the living area is spectacular and the many surfers were entertaining. The condo is very clean and nicely decorated. The kitchen is great and has everything you need . The beds are comfortable. The lanai is such a great place, one our favorite things was sitting on the lanai with a glass of wine at the end of the day to watch the sunset. Kuhio Shores is a perfect location for getting to the many beautiful and exciting things to do on Kauai and Mike and Sue were great to give information about where to go. We loved walking to the spouting horn and to the shops at Kukuiula Village shops. Several very good restaurants there and we enjoyed the farmers market on Wednesday evenings. There is also very good ice cream and shave ice. Beaches on either side and easy access to Poipu Beach and other popular beaches. We are grateful to Mike and sue Galvin for sharing this wonderful place to stay.